Teacher strikes in West Virginia, Oklahoma, Arizona, North Carolina, Kentucky, and Colorado have raised the profile of deteriorating teacher pay as a critical public policy issue. Teachers and parents are protesting cutbacks in education spending and a squeeze on teacher pay that persist well into the economic recovery from the Great Recession. These spending cuts are not the result of weak state economies. Rather, state legislatures have enacted them to finance tax cuts for the wealthy and corporations. This paper underscores the crisis in teacher pay by updating our data series on the teacher pay penalty—the percent by which public school teachers are paid less than comparable workers. This report was produced in collaboration with Center on Wage and Employment Dynamics at the University of California, Berkeley. Providing teachers with a decent middle-class living commensurate with other professionals with similar education is not simply a matter of fairness. Effective teachers are the most important school-based determinant of student educational performance.1 To ensure a high-quality teaching workforce, schools must retain experienced teachers and recruit high-quality students into the profession. Pay is an important component of retention and recruitment. As noted in an earlier paper (Allegretto and Mishel 2016), retention and recruitment is a challenge as states struggle to return to pre-recession teacher levels. Every state headed into the 2017–2018 school year with teacher shortages (Strauss 2017) and new EPI research indicates the teacher shortages persist (Garcia forthcoming). In their study of the teacher shortage in California, Darling-Hammond et al. point to a number of factors limiting the supply of teachers, from layoffs that “left a mark on the public psyche” to frozen salaries, declining working conditions, and increased class sizes. “One sign of the impact is that only 5 percent of the students in a recent survey of college-bound students were interested in pursuing a career in education, a decrease of 16 percent between 2010 and 2014,” the authors noted (Darling-Hammond et al. 2016, iii). As we have shown in our more than a decade and a half of work on the topic, relative teacher pay—teacher pay compared with the pay of other career opportunities for potential and current teachers—has been eroding for over a half a century. In How Does Teacher Pay Compare (Allegretto, Corcoran, and Mishel 2004), we studied the long-term trends in teacher pay. We followed this up with The Teaching Penalty, published in 2008, and updated our findings in other papers (Allegretto, Corcoran, and Mishel 2011; Allegretto and Tojerow 2014; and Allegretto and Mishel 2016). As noted, this body of work has documented the relative erosion of teacher pay. For instance, female teachers enjoyed a wage premium in 1960, meaning they were paid more than comparably educated and experienced workers. By the early 1980s, the wage premium for female teachers became a penalty. 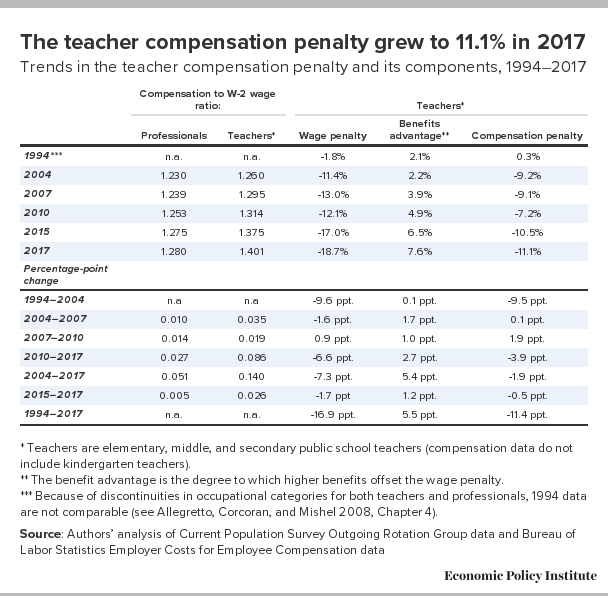 The total compensation penalty (how much less teachers make in wages and benefits relative to comparable workers) has also increased. Average weekly wages of public school teachers (adjusted for inflation) decreased $27 from 1996 to 2017, from $1,164 to $1,137 (in 2017 dollars). In contrast, weekly wages of other college graduates rose from $1,339 to $1,476 over this period. For all public-sector teachers, the relative wage gap (regression-adjusted for education, experience, and other factors known to affect earnings) has grown substantially since the mid-1990s. The teacher wage penalty was 1.8 percent in 1994, grew to 4.3 percent in 1996, and reached a record 18.7 percent in 2017. While relative teacher wage gaps have widened, some of the difference may be attributed to a tradeoff between pay and benefits. In other words, school districts may not be giving teachers raises but are instead offering stable or slightly better benefits, making benefits a larger share of the overall compensation package for teachers than for other professionals. In 2017, nonwage benefits made up a greater share of total compensation for teachers (28.6 percent) than for professionals (21.9 percent). As a result of their growing benefit share of compensation, teachers are enjoying a “benefit advantage” that has grown since 1994, from 2.1 percent to 7.6 percent. But this has not been enough to offset the growing wage penalty. The total teacher compensation penalty was a record-high 11.1 percent in 2017 (composed of an 18.7 percent wage penalty plus a 7.6 percent benefit advantage). The bottom line is that the teacher compensation penalty grew by 11.4 percentage points from 1994 to 2017. This growing compensation penalty is a key part of the story of changing teacher pay but shouldn’t obscure the importance of the wage penalty alone—only wages can be saved or spent on housing and food and other critical expenses. The public school teacher wage penalty grew from 17.0 percent to 18.7 percent from 2015 to 2017. Teacher benefits improved relative to professionals from 2015 to 2017, boosting the benefits advantage from 6.5 percent to 7.6 percent. Despite this improvement, the total compensation (wage and benefit) penalty for public school teachers grew from 10.5 percent to 11.1 percent in 2017. The erosion of teacher pay relative to that of comparable workers in the last couple of years—and in fact since 2008—reflects state policy decisions rather than the result of revenue challenges brought on by the Great Recession. A recent study found that most of the 25 states that were still spending less for K–12 education in 2016 than before the recession had also enacted tax cuts between 2008 and 2016. In fact, eight of the 10 states with the largest reductions in education funding since 2008 were states that had reduced their overall “tax effort”—meaning through tax cuts or other measures they were collecting less in taxes relative to their capacity to generate tax revenue. These eight states were Alabama, Arizona, Florida, Georgia, Idaho, Kansas, Oklahoma, and Virginia. We report teacher weekly wage penalties for each state for the period 2013–2017. These wage penalties adjust for education levels but not for other factors. The five states with the largest teacher wage penalties—Arizona, North Carolina, Oklahoma, Colorado, and Virginia—include four states in which recent teacher protests drew national attention to the erosion of teacher pay. There are two sources of data used in this analysis. For our wage analysis we use data from the Current Population Survey (CPS), and for our benefits analysis we use the Employer Costs for Employee Compensation survey (ECEC). Both sets of data are obtained from the Bureau of Labor Statistics (BLS). Below we discuss our sources and how we address some of the key methodological issues pertinent to understanding teacher wage trends. There are several measurement and data issues regarding the CPS that require some further discussion, and this discussion is included in the subsections below. First, as in our earlier work, we explain our choice of comparing weekly, as opposed to annual or hourly, earnings. Second, we discuss our method and data used in our benefits calculation. For our wage analysis we use CPS data on individual workers from 1979 through 2017. The CPS is a monthly survey of more than 60,000 households conducted by the U.S. Census Bureau for the BLS. We specifically employ the “Outgoing Rotation Groups” sample, or CPS-ORG. The CPS-ORG is one of the data sources most widely used by economists to study wages and employment. The CPS-ORG data are particularly useful due to their large sample size and information on weekly wages. We pool monthly data into a series of annual data with over 150,000 workers for each year. Our analysis restricts the sample to all full-time workers ages 18 to 64 (defining “full time” as working at least 35 hours per week). Teachers are identified using detailed census occupation codes, and our data set includes only elementary, middle, and secondary teachers; prekindergarten and kindergarten teachers, adult educators, and special education teachers are excluded. We also focus only on public school teachers, excluding private school teachers—who on average earn less than public school teachers.3 We also restrict our analysis to data reported by survey respondents; thus we do not include imputed data (i.e., we do not use the substitute values provided by the Census Bureau). A more extended discussion regarding the CPS-ORG data can be found in Appendix A of this paper and also in Appendix A of Allegretto, Corcoran, and Mishel 2008. Figure A presents average weekly wages of public school teachers and of other college graduates, adjusted only for inflation. As noted in Appendix A, non-imputed data are not available for 1994 and 1995; data points for these years have been extrapolated and are represented by dotted lines in the figure. Note: Teachers are elementary, middle, and secondary public school teachers. "College graduates" excludes public school teachers. Non-imputed data are unavailable for 1994 and 1995; data points for these years have been extrapolated and are represented by dotted lines (see Appendix A for more details). Note: Teachers are elementary, middle, and secondary public school teachers. "College graduates" excludes public school teachers. Wages are adjusted to 2017 dollars using the CPI-U-RS. Data are for workers age 18–64 with positive wages (excluding self-employed workers). Non-imputed data are unavailable for 1994 and 1995; data points for these years have been extrapolated and are represented by dotted lines (see Appendix A for more details). In 1979 teachers earned $945 per week, or 21.4 percent less than other college graduates, who earned $1,202. The gap between teachers and other college graduates narrowed into the mid-1990s, falling to a 13.1 percent difference in 1996, but then widened considerably during the tight labor markets of the late 1990s into the early 2000s.8 There was a 13.4 percent jump in pay for nonteacher college graduates from 1996 to 2001 during an unusual time of exceptional wage growth among low-, middle-, and high-wage earners. But inflation-adjusted wages of teachers did not grow strongly during this period because teacher pay is set by long-term contracts and public-sector wages are not as volatile (do not rise and fall as much) as private-sector pay. Teacher weekly wages fell 0.4 percent from 1996 to 2001, generating a 23.7 percent gap. The gap has been fairly consistent throughout the 2000s and 2010s; between 2004 (the peak teacher pay year in the 2000s) and 2017 weekly wages of other college graduates fell $43 (2.8 percent) while teacher weekly wages dropped $52 (4.4 percent). In 2017 the teacher weekly wage was $1,137, $339 or 23.0 percent less than the $1,476 earned by other college graduates. The teacher weekly wage penalty, unadjusted to account for demographic shifts, was substantially greater (by 9.8 percentage points) than the 13.1 percent disadvantage in 1996. Regression-adjusted estimates of relative teacher pay account for any changes in the composition of the workforce, of teachers, and of college graduates over time. Our regression analysis here uses a typical wage model controlling for education, age as a quartic, gender, marital status, geographic region, and race/ethnicity.9 We also expand our analysis to examine teacher wage trends by gender. Trends in public school teacher wages relative to wages of workers with comparable education, experience, and other characteristics are presented in Figure B (estimates for each year are listed in Appendix B). The teacher wage penalty—how much less teachers make than comparable workers—grew from 5.5 percent in 1979 to a record 18.7 percent in 2017. The wage penalty was fairly stable from 1979 to the mid-1990s but then grew into the early 2000s—confirming what we presented in Figure A. After some variability in the mid-2000s, the increasing teacher wage penalty continued to grow from 2010 through 2017, rising from 12.1 to 18.7 percent—driven by a particularly large increase in the wage penalty for female teachers (rising from 6.6 to 15.6 percent). It is noteworthy that the wage penalty shrank in the early portion of the Great Recession as private-sector wages fared worse than those in the public sector, reflecting the inertia in teacher wages due to long-term contracts. This trend was more than reversed in the recovery beyond 2010 as state and local spending cuts sapped teacher pay growth while private-sector wage growth accelerated. Note: Figure shows regression-adjusted weekly wages of elementary, middle, and secondary public school teachers. Non-imputed data are not available for 1994 and 1995; data points for these years have been extrapolated and are represented by dotted lines (see Appendix A for more detail). Note: Figure shows regression-adjusted weekly wages of elementary, middle, and secondary public school teachers. Regression-adjusted estimates include controls for age (quartic), education, race/ethnicity, geographical region, marital status, and gender for the pooled sample. Data are for workers age 18–64 with positive wages (excluding self-employed workers). Non-imputed data are not available for 1994 and 1995; data points for these years have been extrapolated and are represented by dotted lines (see Appendix A for more detail). As illustrated in Figure B, teacher pay differentials vary greatly by gender. The teacher wage penalty currently stands at 15.6 percent for women. The teaching profession was relatively good for women in 1979, when they made 4.2 percent more than comparably educated female workers. Our earlier work examining prior decades also found a 14.7 percent wage premium for female teachers in 1960 that fell to 10.4 percent in 1970, and to 2.9 percent in 1980 (Allegretto, Corcoran, and Mishel 2008, 7). This earlier work combined with the results in Figure B offers a very long negative trend in teacher wages—as female teachers moved from having a substantial wage premium to a large wage penalty. More recently the female teacher wage gap has substantially widened. Referring to Figure B, female teachers earned wages similar to wages of other comparable women workers in the mid-1990s. By 2001, however, female teachers were earning 7.0 percent less than comparable workers, and before the start of the recession in 2007 were still earning 7.9 percent less. Wages for female teachers fared somewhat better in the early part of the recession, but beginning in 2010 the teacher wage penalty for women increased annually until it reached its largest deficit of 15.6 percent in 2017. The teacher wage penalty has always been largest for male teachers—it was 22.1 percent in 1979 and grew to 26.8 percent in 2017. The larger male teacher wage penalty reflects that teaching has been a predominantly female profession. Because of gender discrimination that historically limited occupational options for educated women, these women became a captive labor pool with less leverage to secure higher wages. Thus the pay for teachers has been less than pay in male-dominated professions. Men in predominantly female professions will thus earn substantially less than men in male-dominated professions. The gap between male teacher pay and pay of comparable male workers shrank from 1990 to 1996 but increased quickly during the late 1990s, when wages of college graduates increased considerably and teacher pay stagnated. The large pay penalty that male teachers face goes a long way toward explaining why the gender makeup of the teaching profession has not changed much over the past few decades (three-fourths of teachers are female). Those arguing that teachers are overpaid have a hard time explaining how, if this is so, men have not swarmed to teaching. To this point our analysis has focused on average teacher wage gaps for the United States. 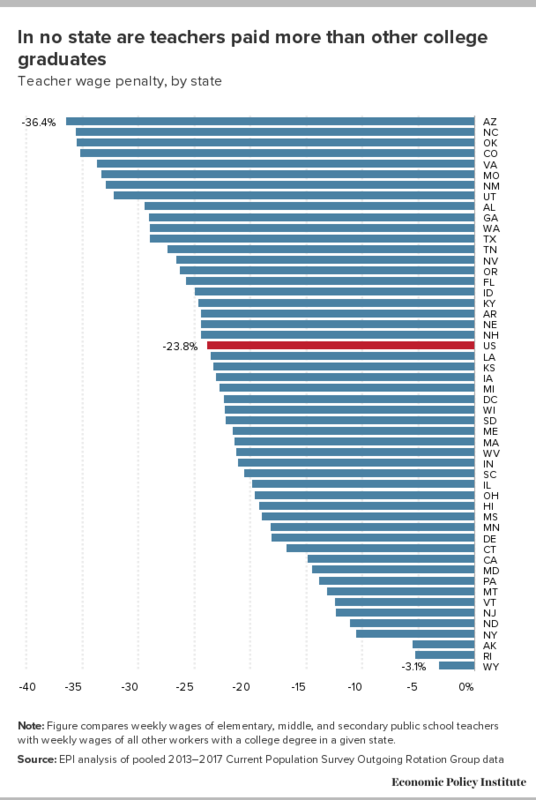 But how do teacher wage gaps differ across states? While the data sets used here do not have sufficient sample sizes for a robust regression analysis for each state, simple within-state analyses of public school teacher wages and wages of other college graduates are informative. We used pooled 2013–2017 CPS-ORG data to calculate state weekly wage ratios, expressed as a percent, for public school teachers and other college graduates by education level (specifically, those whose highest degree attained is a bachelor’s degree and those whose highest degree attained is a master’s degree) and overall. We present these ratios in Appendix C.10 The ratio for the overall United States is 76.2 percent, meaning that, on average, teachers earn just 76.2 cents on the dollar compared with what other college graduates earn. We convert these ratios to a state wage penalty (one minus the ratio) and display the percentage wage penalty by state in Figure C ranked from the largest wage penalty to the smallest. Perhaps not surprisingly, four of the states where teacher protests emerged this year are those with the largest wage penalties, with Arizona (36.4 percent) having the largest penalty followed by North Carolina (35.5 percent), Oklahoma (35.4 percent) and Colorado (35.1 percent). Other states with large wage penalties, all exceeding 29 percent, are Virginia, Missouri, New Mexico, Utah, and Alabama. In 16 states, public school teacher weekly wages lag by more than 25 percent. 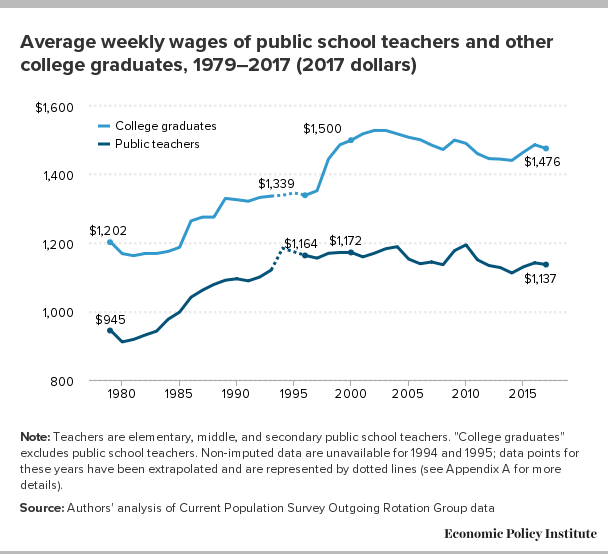 Note: Figure compares weekly wages of elementary, middle, and secondary public school teachers with weekly wages of all other workers with a college degree in a given state. Figure compares weekly wages of elementary, middle, and secondary public school teachers with weekly wages of all other workers with a college degree in a given state. Prekindergarten and kindergarten teachers, adult educators, and special education teachers are excluded. There is no state where teacher pay is equal to or better than that of other college graduates. Wyoming, Rhode Island, and Arkansas have the most modest wage penalties, of approximately 5 percent or less, and these three are the only states with penalties lower than 10 percent. Our analysis of relative teacher pay thus far has focused entirely on teachers’ wages relative to other comparable workers. Yet benefits such as pensions and health insurance are an increasingly important component of the total compensation package. Teachers do enjoy more attractive benefits packages than other professionals; thus, our measure of relative teacher wages overstates the teacher disadvantage in total compensation. This section examines how we adjust our estimates of relative teacher wages to reflect differences in total compensation; that is, it measures the size of the advantage teachers have in benefits, relative to professionals, and adjusts the teacher wage penalty to derive a relative compensation comparison. We draw heavily on our prior work analyzing the “benefits bias” (Allegretto, Corcoran, and Mishel 2004; 2008) and update our calculations to 2017. While the total compensation gap rounds out our understanding of how teachers are faring compared with other professionals, the growing wage penalty is still important and critical to keep in mind, given the different natures of wages and benefits—only wages can be spent or saved! n.a n.a -9.6 ppt. 0.1 ppt. -9.5 ppt. 0.010 0.035 -1.6 ppt. 1.7 ppt. 0.1 ppt. 0.014 0.019 0.9 ppt. 1.0 ppt. 1.9 ppt. 0.027 0.086 -6.6 ppt. 2.7 ppt. -3.9 ppt. 0.051 0.140 -7.3 ppt. 5.4 ppt. -1.9 ppt. 0.005 0.026 -1.7 ppt 1.2 ppt. -0.5 ppt. n.a. n.a. -16.9 ppt. 5.5 ppt. -11.4 ppt. * Teachers are elementary, middle, and secondary public school teachers (compensation data do not include kindergarten teachers). ** The benefit advantage is the degree to which higher benefits offset the wage penalty. *** Because of discontinuities in occupational categories for both teachers and professionals, 1994 data are not comparable (see Allegretto, Corcoran, and Mishel 2008, Chapter 4). The first pair of columns in Table 1 present the ratios of total compensation to W-2 wages for state and local K–12 public school teachers and for professionals. These ratios allow us to examine how important wages are relative to benefits in the total compensation package. So for example, we see that in 2017, for every dollar in W-2 wages teachers are provided 40.1 cents in benefits, implying benefits account for 28.6 percent of total compensation.12 Professionals enjoy a weaker benefit package, with 28 cents in benefits for every dollar of W-2 wages earned, a benefits package of 21.9 percent of total compensation. One reason health and pension costs are higher for teachers is that teacher health benefits are provided for a full year for workers who receive salaries for less than a full year. The next set of columns in Table 1 provide our estimate of the teacher wage penalty from Figure B followed by the “benefits bias” or the “benefits advantage.” These two estimates can then be combined to estimate the teacher compensation gap, shown in the last column. In other words, the “benefits advantage” estimate tells us to what extent an estimated relative wage disadvantage will be offset by a relative benefits advantage. We estimate that in 1994 there was essentially no compensation penalty for teachers, as the 1.8 percent wage penalty was fully offset by a 2.1 percent benefits advantage. The wage penalty grew substantially since 1994, as noted above, rising 16.9 percentage points by 2017. However, the 5.5 percentage-point increase in the benefits advantage partially offset the wage trends so that the overall compensation penalty grew by 11.4 percentage points.14 The compensation penalty actually subsided a bit in the early part of the Great Recession and recovery, from 2007–2010, as the slight decline in the wage penalty by 0.9 percentage points was accompanied by a 1.0 percentage-point increase in the benefits advantage. Between 2010 and 2017, however, the 6.6 percentage-point spike in the wage penalty was only slightly offset by a 2.7 percentage-point growth in the benefits advantage. The result was the corresponding 3.9 percentage-point growth in the compensation penalty over the 2010–2017 period, a time of recovery but one during which states cut education spending, in part to accommodate tax cuts for the rich and for corporations (as noted earlier in the “Tax and spending cuts limit teacher wages in the recovery” section of this report). These trends in wages and benefits are probably related. Recent years have seen extreme pressure on school district budgets to curtail hiring and costs. It may be the case that teachers and school districts have sought to preserve benefits by restraining wage costs. If this were the case relative to the employers of professionals we would observe a greater teacher wage penalty with a partially offsetting increased benefits advantage. The bottom line is that since 1994 the teacher compensation penalty has increased by 11.4 percentage points. The opportunity cost of becoming a teacher and remaining in the profession becomes more and more important as relative teacher pay falls further behind that of other professions. The large wage penalty for male teachers likely is a key reason why the gender mix of teachers has not changed much over time. That women, once a somewhat captive labor pool for the teaching profession, have many more opportunities outside the profession today than in the past (Corcoran, Evans, and Schwab 2004) means that growing wage and compensation penalties will make it all the more difficult to recruit and retain high-quality teachers. Moreover, the ever-increasing costs of higher education and burdensome student loans are also a barrier to the teaching profession in light of a widening pay gap. The recent trends we document in this report with CPS-ORG data represent only a small part of a much larger long-run decline in the relative pay of teachers. To track that longer decline, we turn from CPS-ORG to U.S. decennial census data. U.S. decennial census data show that the wage gap between female public school teachers and comparably educated women—for whom the labor market dramatically changed over 1960–2000—grew by nearly 28 percentage points, from a relative wage advantage of 14.7 percent in 1960 to a disadvantage of 13.2 percent in 2000. 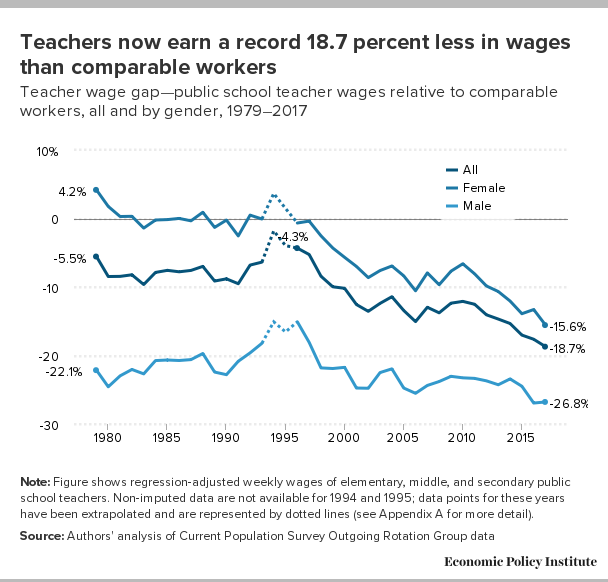 Among all (male and female) public school teachers, the relative wage disadvantage grew almost 20 percentage points over 1960–2000 (Allegretto, Corcoran, and Mishel 2008, 7). Our results in this paper show that the teacher wage penalty grew an additional 8.5 and 9.9 percentage points, respectively, for all teachers and for female teachers from 2000 to 2017. Improvements in the nonwage benefits of primary and secondary school teachers have partially offset the worsening wage disparities. The weekly total compensation (wages plus benefits) penalty for teachers in 2017 was 11.1 percent, or 7.6 percentage points less than the 18.7 percent weekly teacher wage penalty estimated for that year. It is good news that teachers are able to bargain for a total compensation package—though it seems they may have forgone wage increases for benefits recently. But, as we’ve documented, teacher wages have been stagnant since the mid-1990s. This makes the wage penalty, on its own, critically important as it is only earnings that families can put toward making ends meet—its only earnings that can pay for expenses such as rent, food, and student loan payments. If the policy goal is to improve the quality of the entire teaching workforce, then raising the level of teacher compensation, including wages, is critical to recruiting and retaining higher-quality teachers. Policies that solely focus on changing the composition of current compensation (e.g., merit or pay-for-performance schemes) without actually increasing compensation levels are unlikely to be effective. Simply put, improving overall teacher quality, preventing turnover, and strengthening teacher retention requires eliminating the teacher pay penalty. Sylvia A. Allegretto is a labor economist and chair of the Center on Wage and Employment Dynamics, which is housed at the Institute for Research on Labor and Employment at the University of California, Berkeley. She is also a research associate of the Economic Policy Institute and is co-author of many EPI publications, including past editions of The State of Working America, How Does Teacher Pay Compare?, and The Teaching Penalty: Teacher Pay Losing Ground. She has a Ph.D. in economics from the University of Colorado at Boulder. Lawrence Mishel is a distinguished fellow and former president of the Economic Policy Institute. He is the co-author of all 12 editions of The State of Working America. His articles have appeared in a variety of academic and nonacademic journals. His areas of research include labor economics, wage and income distribution, industrial relations, productivity growth, and the economics of education. He has a Ph.D. in economics from the University of Wisconsin at Madison. In this appendix we provide a summary of the data used in this analysis. Further documentation can be found in Allegretto, Corcoran, and Mishel (2008). As noted in the body of the report, we use individual data from the Current Population Survey (CPS) from the Bureau of Labor Statistics (BLS), specifically the “Outgoing Rotation Group” sample, or CPS-ORG for our wage analysis. The teachers studied here are elementary, middle, and secondary school teachers (teachers not included are kindergarten, early education and special education). The CPS is the monthly survey administered by the BLS to more than 60,000 households to measure and report on unemployment. The CPS-ORG data used here are based on reports from roughly 150,000 workers each year. The CPS-ORG is one of the data sources most widely used by economists to study wages and employment. The CPS-ORG data are particularly useful due to their large sample and information on weekly wages. Since 1994, the CPS-ORG survey has asked respondents to report their wages on a weekly, biweekly, monthly, or annual basis (whichever the respondent finds most appropriate), from which the BLS then derives the weekly wage. More than half of teachers report an annual (as opposed to a monthly, biweekly, or weekly) wage to BLS. Respondents also report the hours they worked last week. There are several measurement issues that require some further discussion. First, as in our earlier work, we limit our analysis to workers whose wage data were provided by the respondent and not “imputed,” or assigned by the Census Bureau, which imputes earnings for the BLS. Second, we expand on the explanation we gave in the body of the report on why we compare weekly, as opposed to annual or hourly, earnings. Third, we note several coding changes over the period under study. In addition, the share of CPS-ORG earnings data that are imputed has grown markedly over time; hence, the bias has worsened. In 1979, imputed earnings data in the CPS-ORG were 17 percent; by 2000 imputations accounted for 33 percent of the sample, and in 2015 they made up 41 percent of the sample. The implications for our analysis of the teacher wage gap are significant. In the early years, 1979 through 1993, the teacher wage gap differential between using all the data available (without regard for imputations) and analyzing only non-imputed observations was at most a 2 percentage-point difference—meaning that the inclusion of imputed data lessened the teacher wage gap by 2 percentage points or less. But, post 1996 the gap steadily grew, and in 2015 the differential was larger than ever. For all teachers, the teacher wage penalty of 17.0 percent for 2015 reported in Figure B (estimated without imputed data) would be mitigated to a 10.0 percent gap had imputations been included. The bias in closing the gap is 6 and 9 percentage points for female and male teachers, respectively. Imputed data are not available in 1994 and only for the last four months of 1995. Thus, we extrapolate results for these two years by comparing output from using all the data available to output from using non-imputed data only. We do this comparison for the years just prior to and just after 1994 and 1995. Comparing the results gives us a reasonable rough estimate of what may be expected if non-imputed data were available for 1994 and 1995. As we note in this report, such decisions regarding pay interval (weekly, annual, or hourly) become mostly irrelevant when considering changes in relative pay over time since a constant bias is consistent with identifying an accurate trend. Changes in relative wages can be expected to be similar as long as the relative work time (between teachers and comparable professionals) remains constant. For example, if the ratio of weekly hours worked by teachers relative to those worked by comparable workers remains constant over time, then estimates of changes in hourly wages will be the same as for weekly changes. Similarly, estimated changes in relative annual earnings will parallel those for weekly earnings as long as the annual weeks and hours worked by teachers have not changed relative to those of comparable workers. Some researchers (e.g., Podgursky and Tongrut 2006) have contended that the use of the CPS-ORG data downwardly biases teacher earnings. This issue is particularly relevant to CPS data prior to the 1994 CPS redesign (more on this below). In Allegretto, Corcoran, and Mishel 2008 we benchmarked the CPS-ORG data to annual data from the Annual Social and Economic Supplement (ASEC) of the CPS, the “March CPS.” This extensive benchmarking exercise provided validation that the CPS-ORG data are consistent with annual March data, which Hanushek and Rivkin (1997, 2004), Temin (2002, 2003) and Podgursky and Tongrut (2006) have used in their analyses of teacher wage trends. As expected, the annual wage gap is just the weekly wage gap multiplied by the ratio of teacher and nonteacher annual weeks worked, with the caveat that we have more confidence in the post-redesign CPS data. Our benchmarking exercise leaves little doubt that there has been deterioration in the relative earnings of teachers over time. Moreover, our use of weekly wage comparisons in all of our work on teacher pay allows us to avoid unproductive discussions of work years, summers off, and so on. Allegretto, Corcoran, and Mishel 2008 also show in Chapter 2 that the long-term trends in the March CPS, decennial census, and CPS-ORG data all yield similar findings regarding the relative erosion of teacher wages. The CPS was redesigned in 1994. The change in the CPS survey question on earnings appears to have resulted in a significantly higher weekly wage among teachers, as teacher wages rose 10.2 percent between 1993 and 1994 (the year the redesigned survey was first used)—far faster than the 2.2 percent increase among nonteacher college graduates. The additional 8 percent wage growth among teachers appears to represent the effects of a correction for the underlying bias in the pre-1994 survey. Consequently, our estimates incorporate the pre-1994 data in a way that does not allow this bias to be built into our results. A second issue concerns the coding schemes regarding education. Prior to 1992 the survey asked for the “highest grade of school attended,” and in 1992 the question was changed to “highest level of school completed or the highest degree received.” Thus, degrees are not known prior to 1992 even as a best guess crosswalk is used. For more information on CPS coding schemes and the 1994 redesign, see Cohany, Polivka, and Rothgeb 1994. Note: The wage gap is how much elementary, middle, and secondary public school teachers make in weekly wages relative to comparable workers. Asterisks indicate that imputed data are unavailable in 1994 and only for the last four months of 1995. Thus, we extrapolate results for these two years by comparing output from using all the data available to output from using non-imputed data only. Note: The wage gap is how much elementary, middle, and secondary public school teachers make in weekly wages relative to comparable workers. Asterisks indicate that imputed data are unavailable in 1994 and only for the last 4 months of 1995. Thus, we extrapolate results for these two years by comparing output from using all the data available to output from using non-imputed data only. We do this comparison for the years just prior to and just after 1994 and 1995. Comparing the results gives us a reasonable rough estimate of what may be expected if non-imputed data were available for 1994 and 1995. Data are for workers age 18–64 with positive wages (excluding self-employed workers). * Totals are weighted averages of the B.A.- and M.A.-level weekly wages where the weights are the shares of teachers with a B.A. or M.A. This ensures that the distribution of education among teachers and other college graduates does not affect the comparison. Data are for workers ages 18–64 with bachelor’s or master’s degrees and positive wages (excluding self-employed workers). 1. We hear often that a strong teacher is the single biggest within-school factor influencing learning and student achievement, and both research and common sense affirm this. It is important to keep in mind, however, that teachers operate within a complex ecosystem of fellow teachers, school leadership, curriculum, standards, and a range of resources, including parent and community engagement, all of which have major impacts on teacher effectiveness. Indeed, as Anthony Bryk and his colleagues found in their research on school reforms in Chicago, school improvement—and thus increased achievement—is akin to baking a cake, with five essential ingredients that constantly interact (Bryk et al. 2010). So while it’s critically important to design policies to strengthen the teacher corps, that effort must be complemented by larger work to improve school ecosystems as a whole. 2. 1979 is the first year for which we have sufficient annual data to track trends in teacher relative pay. 3. To find out more about public versus private school teachers, see an in-depth paper by Allegretto and Tojerow (2014). 4. The earlier work referenced here is Allegretto, Corcoran, and Mishel 2004 and Allegretto, Corcoran, and Mishel 2008. 5. In Allegretto, Corcoran, and Mishel 2008, we compared our results on the relative weekly pay of teachers with our results on the relative hourly pay of teachers using CPS-ORG data on hourly wages and found no qualitative differences. 6. In Appendix A of Allegretto, Corcoran, and Mishel 2008, we benchmarked CPS-ORG weekly wages to annual wages in the March CPS (CPS Annual Social and Economic Supplement) and found the two measures to be consistent. 7. We have modified our benefits advantage calculations from Allegretto, Corcoran, and Mishel 2008 in two ways. First, we have switched to obtaining K–12 teacher benefits data from Table 7 (for state and local government workers) rather than from the broader group of civilian workers (Table 3). This is appropriate because our analysis is of public school teachers. This switch raises both the benefits advantage (e.g., 6.5 percent versus 5.9 percent in 2015) and its growth over time (e.g., 4.3 percentage points versus 4.1 percentage points from 2004 to 2015). The second change is that our earlier method calculated the benefits advantage assuming a steady 14 percent wage penalty in every year. We now employ the actual wage penalty in the relevant year. 8. Recall that the dotted lines are guesstimates, and CPS underwent a major redesign in 1994. 9. To present pay gaps in percentage terms we exponentiate the estimated coefficients and subtract 1. 10. State totals are weighted averages of the bachelor’s degree– and master’s degree–level weekly wages in which the weights are the shares of teachers with a bachelor’s degree but no more education or master’s degree but no more education. This ensures that the distribution of education among teachers and other college graduates does not affect the comparison. 11. The ECEC provides compensation data for primary and secondary and special education school teachers and for a broader category of “teachers.” We analyze the narrower category, which matches closely our definition of teachers in our ORG data, among state and local public-sector workers. The inclusion of kindergarten and special education teachers in the benefits analysis does not produce any substantial differences. 12. The ratio is of compensation to W-2 wages. Therefore, the inverse (1/ratio) is the W-2 share of total compensation. One minus the W-2 share is the benefits share. 13. This is true for the data we have going back to 1994. In earlier years, back to 1960, there was actually a wage premium or a modest wage penalty so the compensation penalty would have been smaller than in years since 1994. 14. As reviewed in Allegretto, Corcoran, and Mishel 2008, there are discontinuities in the occupational codes in the ECEC series for both teachers and professionals. The data for teachers in 1994–2003 is for all teachers, not just primary and secondary school teachers, and the definition of professionals in the data before 2004 differs from the data starting in 2004. We use the changes in 1994–2003 and add them to the 2004–2015 period to obtain the long-term change in the benefits advantage. This implicitly assumes no change over 2003–2004. That is, the benefit bias grew by 0.1 percentage points from 1994 to 2003 for teachers overall (K–12, university, and others). We assume that was the change among primary and secondary school teachers and therefore subtract 0.1 percent from the benefit advantage in 2004 (calculated using K–12 teacher data) to obtain our estimate of the 1994 benefits advantage. 15. As measured from 1999 to 2017 to reflect the 2000 census data measuring 1999 wages. 16. To find out more about public versus private teachers, see Allegretto and Tojerow 2014. 18. In Allegretto, Corcoran, and Mishel 2008 we compared the relative hourly pay of teachers using CPS-ORG data on hourly wages and found no qualitative differences in our results. Allegretto, Sylvia A., Sean P. Corcoran, and Lawrence Mishel. 2008. The Teaching Penalty: Teacher Pay Losing Ground. Washington, D.C.: Economic Policy Institute. Allegretto, Sylvia A., Sean P. Corcoran, and Lawrence Mishel. 2011. The Teaching Penalty: An Update through 2010. Economic Policy Institute Issue Brief no. 298, March 2011. Allegretto, Sylvia A., and Ilan Tojerow. 2014. “Teacher Staffing and Pay Differences: Public and Private Schools.” Monthly Labor Review, September 2014. Allegretto, Sylvia A., and Lawrence Mishel. 2016. “The Teacher Pay Gap Is Wider Than Ever: Teachers’ Pay Continues to Fall Further behind Pay of Comparable Workers.” Economic Policy Institute, August 2016. American Federation of Teachers (AFT). 2018. A Decade of Neglect: Public Education Funding in the Aftermath of the Great Recession. Bryk, Anthony S., Penny Bender Sebring, Elaine Allensworth, Stuart Luppescu, and John Q. Easton. 2010. Organizing Schools for Improvement: Lessons from Chicago. Chicago: Univ. of Chicago Press. Bureau of Labor Statistics (BLS). 2018. Employer Costs for Employee Compensation Historical Listing: National Compensation Survey, March 2004 – March 2018. Cohany, Sharon R., Anne E. Polivka, and Jennifer M. Rothgeb. 1994. “Revisions in the Current Population Survey Effective January 1994.” Employment and Earnings, February 1994. Corcoran, Sean P., William N. Evans, and Robert M. Schwab. 2004. “Women, the Labor Market, and the Declining Relative Quality of Teachers.” Journal of Policy Analysis and Management 23, no. 2: 449–470. Darling-Hammond, Linda, Roberta Furger, Patrick M. Shields, and Leib Sutcher. 2016. Addressing California’s Emerging Teacher Shortage: An Analysis of Sources and Solutions. Learning Policy Institute. Garcia, Emma. Forthcoming. Emerging Teacher Shortages: Teacher Supply, Schools’ Staffing Needs, and Equity in the Allocation of High-Quality Teachers (working title). Economic Policy Institute. Greene, Jay P., and Marcus A. Winters. 2007. How Much Are Public School Teachers Paid? Manhattan Institute, January 2007. Hanushek, Eric A., and Steven G. Rivkin. 1997. “Understanding the Twentieth-Century Growth in U.S. School Spending.” Journal of Human Resources 32, no. 1: 35–68. Hanushek, Eric A., and Steven G. Rivkin. 2004. “How to Improve the Supply of High-Quality Teachers.” In Brookings Papers on Education Policy: 2004, edited by D. Ravitch, 7–44. Washington, D.C.: Brookings Institution Press. Hirsch, Barry T., and Edward J. Schumacher. 2004. “Match Bias in Wage Gap Estimates Due to Earnings Imputation.” Journal of Labor Economics 22, no. 3: 689–722. Podgursky, M., and R. Tongrut. 2006. “(Mis-)Measuring the Relative Pay of Public School Teachers.” Education Finance and Policy 1, no. 4: 425–440. Strauss, Valerie. 2017. “Teacher Shortages Affecting Every State As 2017–18 School Year Begins,” Washington Post, August 28, 2017. Temin, Peter. 2002. “Teacher Quality and the Future of America.” Eastern Economic Journal 28, no. 3: 285–300. Temin, Peter. 2003. “Low Pay, Low Quality.” Education Next 3, no. 3: 8–13. U.S. Census Bureau, Current Population Survey Outgoing Rotation Group microdata (U.S. Census Bureau CPS-ORG). Various years. Survey conducted by the Bureau of the Census for the Bureau of Labor Statistics [machine-readable microdata file]. Data for 2004–2018.